Barclays has partnered with Deloitte, ISDA and Thomson Reuters to sponsor the 2018 Barclays “DerivHack” hackathon. The underlying goal of the hackathon is to find a blockchain solution to process their derivatives contracts. In order to increase the efficacy of their systems, Barclays is exploring which blockchain solution, in particular, will work most feasibly alongside the IDSA Common Domain Model (CDM). The ISDA (CDM) essentially allows a consensus between different firms regarding the infrastructure of the derivatives market, creating a blueprint for how derivatives should be managed and traded throughout the life cycle of a trade. Allowing a standard upon which new technology, such as blockchain, can be applied. Participants will solve predetermined derivative based use cases, using ISDA’s CDM to simulate and provide sample trade data. IDSA CDM will establish a common process and lay down data standards amongst participants. 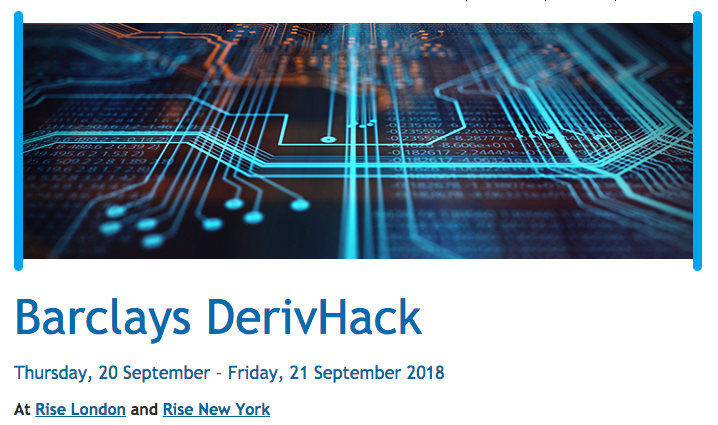 DerivHack will run over the course of two days and will take place in both London and New York. Rumors that Barclays have been delving deeper into cryptocurrency emerged recently with two former traders at the bank revealing that Barclays we’re drafting a business plan to implement a crypto trading desk. However, Barclays denied the rumors stating that they had no such plans at this time.